While Aussies across the country waited in anticipation for the Federal Budget announcement on Tuesday night, there was one politician in the crowd who well and truly stole the show. Although Treasurer Josh Frydenberg was meant to be the one capturing all of the attention of Aussies as he delivered the budget surplus of $7.1 billion, all eyes were instead on Julie Bishop. 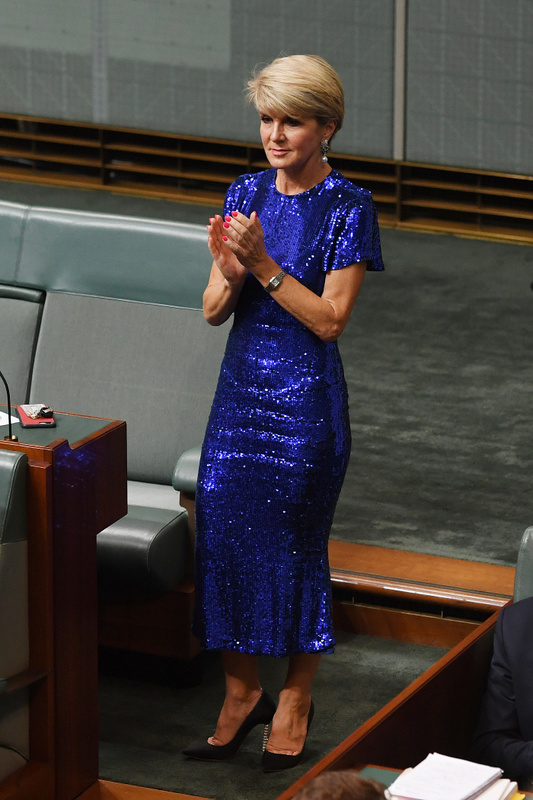 The 62-year-old, who is known for her fabulous fashion sense, certainly wowed in a tightly fit, blue sparkly dress, showing off her figure perfectly during one of her final appearances in parliament. Bishop exuded confidence in the stylish number, reportedly worth $1,299, which she matched with a pair of dangly pearl earrings and bright pink nail polish. It wasn’t just her outfit which drew attention as the politician was snapped celebrating following the budget announcement, throwing her hands up in the air with excitement. Within minutes of her appearance in parliament, the former minister for foreign affairs received a flurry of attention online with comments of both love and criticism for her bold dress. Some were absolutely disgusted with her fashion choice, while others praised the politician calling her their “spirit animal”. “I very much respect Julie Bishop’s work and fashion sense, but it does seem a bit off to wear a dress to the budget which was equivalent to the GDP of a small nation,” a second commented. Her latest appearance follows comments from the politician last month about how lonely it can be as a woman in politics, in a talk at the Sydney Opera House. Are you a fan of Julie Bishop? What do you think of her outfit choice? Do you think it was appropriate to wear to the Federal Budget announcement?